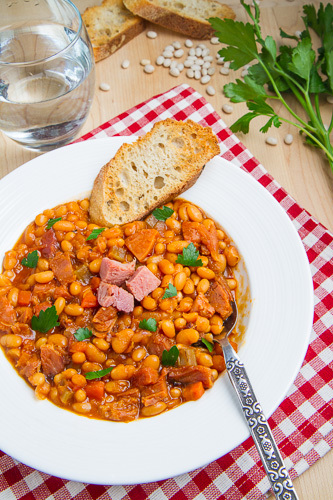 A ham and bean soup with all of the flavours of maple bourbon baked beans! Although a ham dinner is pretty amazing I sometimes think that I like the leftovers even more, especially that ham bone! 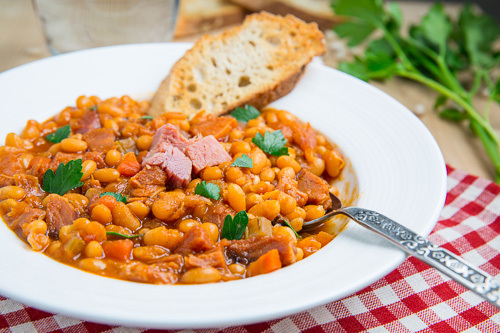 One of my favourite ways of enjoying the ham bone and some of the ham leftovers is in a ham and bean soup which is so easy to make and so unbelievably good; pure comfort food! This time I thought that I would change things up and instead of making a classic ham and bean soup I would make a baked bean themed ham and bean soup. I started out with my standard ham and bean soup recipe including the classic onion, carrot and celery combo followed by ham broth and the beans but then I took a u-turn and started with the baked bean flavours including a sweetener, molasses, ketchup, mustard, worcestershire sauce and a splash cider vinegar. Instead of using simple brown sugar for the sweetener I went with maple syrup to add another layer of flavour and I kicked things up a bit with a hit of bourbon and spicy chipotle chilies before finishing the soup off with the ham. 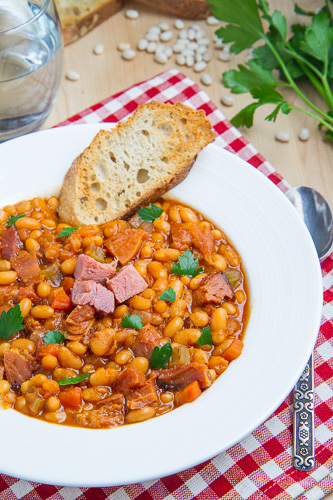 This ham and baked bean soup is a great way to enjoy the ham bone and leftover ham in a way that makes the ham dinner look a little boring, though definitely worth it! Serve with crusty bread to mop up every last drop! 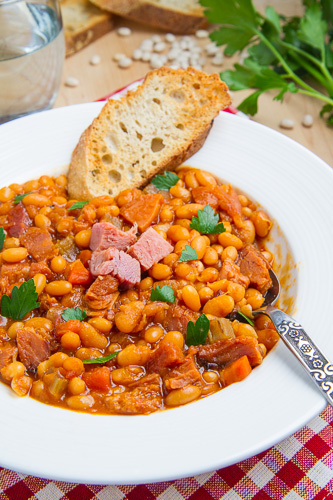 A bowl of this ham and baked bean soup would be amazing for breakfast! Heat the oil in a pan over medium-high heat, add the onion, carrots and celery and cook until tender, about 7-10 minutes. Add the broth, white beans and ham bone, maple syrup, bourbon, ketchup, molasses, mustard, worcestershire sauce, apple cider vinegar and chipotle chili in adobo, bring to a boil, reduce the heat and let simmer, covered, until the beans are tender, about 1-2 hours. Remove the bone, optionally puree some of the soup with a blender, add the ham and season with salt and pepper and remove from heat. Slow Cooker: Optionally implement steps 1 & 2, place everything except the diced ham in the slow cooker and cook on low for 8-10 hours or high for 3-4 hours before implementing step 4. Option: Replace the ham with 1/2 pound bacon, cut into one inch pieces and cooked for a maple, bourbon and bacon baked bean soup! That looks super wholesome and delicious! I loved this! I used the 15 bean mix. I decided not to use the adobo sauce. It was grand! I loved it. This is cooking away in my crockpot right now. Cannot wait to try it for dinner tonight!! A great soup for using leftover ham! I ended up with @ 8 servings. I used Great Northern beans and chicken broth. I did add one chipotle pepper, and I found it added more heat than I wanted – I will omit it the next time I make the soup. Because of the undesirable heat, I added another 2 cups of broth and a bit more maple syrup to balance out the heat, and it helped without diluting the other ingredients. I also added 3 cups of diced ham, not just 2. A nice alternative to split pea and ham soup.